Cloud Security & Cloud Identity Management. 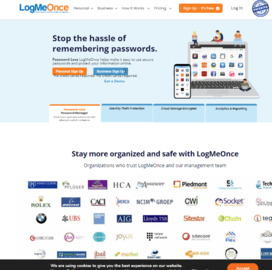 LogmeOnce provides users with solution to multiple Password problems, Single Sign-On (SSO), and Identity Management (IdM). LogmeOnce provides Web based SSO. Click Start Shopping to earn 20% Cash Back at LogMeOnce.